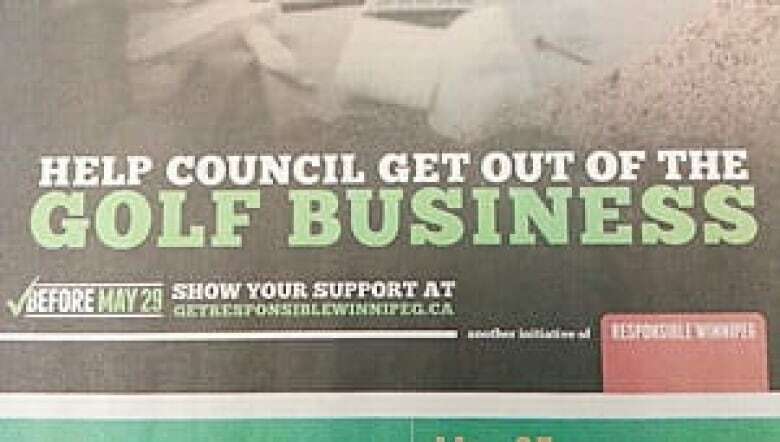 A $90,000 campaign encouraging the public to lobby councillors to get out of the golf business was paid for by the City of Winnipeg, CBC News has learned. 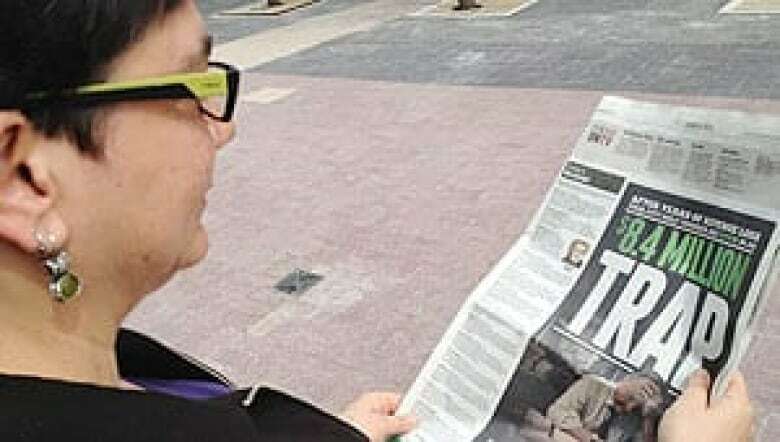 A half-page, full-colour newspaper advertisement, which would have cost several thousand dollars, claims to be from a group called "Responsible Winnipeg." It encourages people to email city councillors, demanding they vote to "get out of the golf business." While it looks like a citizen group is behind it, the mayor's office has confirmed that it is an initiative by the city. "The ad is being paid for through the budget for Office of Policy Development and Communications which supports Executive Policy Committee," a city spokesman stated in an email to CBC News. The spokesperson said the campaign, which includes the advertisements and a website, costs approximately $90,000. That news has surprised several councillors, including Grant Nordman, Paula Havixbeck, Ross Eadie and Jenny Gerbasi. Gerbasi said she is outraged and called it an apparent pressure tactic to get the public on the city's side ahead of the May 29 council vote on the issue of privatizing municipal golf courses. "It's baffling and there's a lot of questions that should be answered about whether this is ethical, whether this is appropriate, how much it's costing," she said. "It's not as if there's some unanimous message that council wants to get across to the public," she added. "This is a political exercise with public money to convince, to put pressure on councillors to vote a certain way." The city is calling on council to approve a plan to lease out the golf courses, which officials say are losing almost $850,000 a year. The vote needs the approval of two-thirds of council to pass. Havixbeck called the ad a misuse of taxpayer dollars. "They entrust us to spend citizens' money and this seems — tens of thousands of dollars on an ad campaign to support getting out of the golf course business — just seems really ludicrous," she said. When asked about the Responsible Winnipeg campaign, Nordman wrote, "For the record I have no knowledge of who is behind the website you mention." Eadie said he will call for Nordman, who is the chair of the governance committee of council, "to get to the bottom of where the money is coming from to pay for such advocacy efforts." Eadie accused Katz and deputy mayor Russ Wyatt of promoting their personal opinions in the ads before the matter has even come to council. He added that he's angry that the campaign is being funded out of the communications budget for the executive policy committee, informally known as the mayor's cabinet. "There is no way that a communications department, and the people that work within it, should be helping to prepare political messages," Eadie said. Mike Davidson of CUPE Local 500, the union representing Winnipeg city workers, said he is outraged the city is using taxpayers' dollars to lobby councillors ahead of a vote. "That the ad was out there to lobby councillors to privatize public services … I've never heard of this being done before, so it was very alarming to hear this," he said. Davidson said CUPE has used its own advertising to lobby councillors against privatizing golf courses. "The big difference would be that our members pay for our advertising. [In] this case here, my understanding is [that] citizens are paying for this advertising," he said. Winnipegger Steven Kohm sent an email to all city councillors shortly after the CBC News story was first published, saying he wants "to register my firm opposition to the use of any public funds to pay for media campaigns disguised as grassroots community efforts. "This is an irresponsible and underhanded use of public office and tax dollars." Jen Jacobsen said she had not even heard of Responsible Winnipeg, and she was surprised to hear the city paid for the ad. "Oh, that's disappointing. That's a bit misleading. Shouldn't it say it would be sponsored by the city?" she said. Mayor Sam Katz said it was "an oversight" that the City of Winnipeg's logo was not on the advertisement, or any other indication that the ad was paid for by the city. Katz said it won't happen again, but he added that the public should expect to see a whole lot more of the ads from Responsible Winnipeg on bus shelters and billboards, in newspapers and on radio. When asked about lobbying citizens using city funds, Katz said it is important to correct misinformation about the controversial golf course issue and inform the public. "We want to make sure that everybody knows the facts and is well informed so that a wise decision will be made, and the public has a right to know we want to make sure they're well-informed," he said.